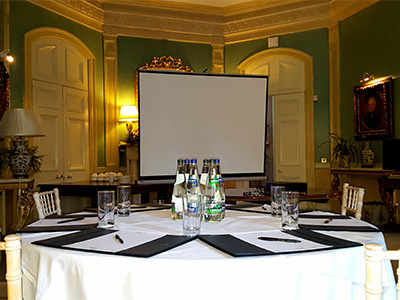 Located just one hour from Dublin, Marlfield House is the perfect venue for corporate events. Privately owned and with 21 bedrooms, two restaurants, 36 acres of gardens and a long standing reputation for excellence it provides the unique location for important corporate gatherings including brainstorming, team building, board room meetings, product launches and think tank meetings and can cater for meetings from 6 to dinners for up to 140. For more information or bookings, simply complete the enquiry form below or call 053 942 1124. And for when all the work is done there are two bars, the Library Cocktail Bar and The Duck Bar! The house and grounds provide enormous privacy for meetings. Small meetings who choose Marlfield tend to have the house to themselves during the day providing great privacy and the ideal environment for working. The Drawing Room, Grand Hall, Library and Conservatory each provide endless possibilities as break out rooms for different uses. We can arrange a large variety of team building activities including archery, falconry, clay pigeon shooting, segway games, cooking and cocktail making classes to name a few. Massage treatments are also available. The Stables Fitness and Well Being located just five minutes from Marlfield provides endless team building opportunities from yoga and studio challenges to obstacle steeplechase in a rural environment. Imagine holding a private event whether it be a wedding ceremony, wedding reception, anniversary, special birthday, corporate event, charity event or fashion show where the only guests there are those you have invited! Exclusive use of Marlfield Country House Hotel in Wexford includes the entire house and its beautiful gardens ensuring that you and your guests enjoy total privacy in a homely and elegant environment. The charming reception rooms, beautiful bedrooms, restaurant and gardens provide the perfect backdrop for a special occasion for family and friends. In addition our chefs and excellent team of staff will provide the most wonderful food and friendly service for your very special occasion.